Nice estate find just in time for the 50th anniversary of the Fab Four’s appearance on the Ed Sullivan Show on Feb. 7th 1964. I hate to admit this because it dates me too, but I remember seeing this show back then. I was a very young teenager. 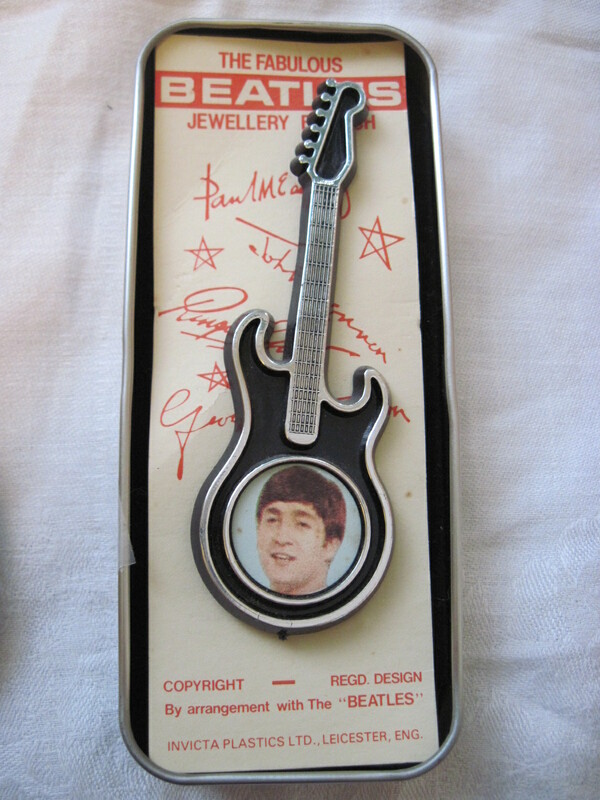 This plastic brooch is titled “The Fabulous Beatles Jewellery Brooch” and depicts John Lennon on the guitar. This dates to 1964 at the peak of the ‘British Invasion’. The brooch is attached to a cardboard backing that has copies of all four Beatles signatures. The brooch is 4″ long. Please note: This has now been SOLD! !